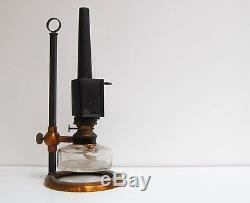 For sale, a late Victorian microscope oil lamp by W Watson & Sons. This rare lamp is comprised of a solid brass circular base on which the makers name is engraved to W Watson & Sons, 313 High Holborn, London. Attached to the base is a brass square sectioned column on which the oil lamp is fitted allowing for adjustment of height. The lamp is attached from an arm to the lamp base and consists of a glass reservoir with oil burner and wick adjustment wheel stamped to E. The chimney has a removable glass window for emitting the light for use with the microscope. It was not until 1876 that the first microscopes were produced by the firm, by which time it had become W. Watson & Son with the first of his sons joining the family business. It has also moved to the High Holborn address with which it is best associated. In 1881, William Watson died and shortly after, the business became W. Watson & Sons with the addition of Williams second son. The brothers continued the business and in 1908 it was incorporated as a limited company. It continued under family ownership until 1949 whereafter it was owned in various guises by Philips until it eventual closure in 1981. Given the numerous changes to the company name during its early life, we can accurately date this microscope lamp to between 1882 1908. They were wide global exporters and produced lamps for various UK retailers during the period. Lamps parts with the E Miller stamp can be found on microscope lamps by both Watson & Swift during this time and these specialist part were being bought in and incorporated into lamps on the finishing benches of numerous microscope manufacturers. Jason Clarke Antiques are happy to discuss carriage, condition or for any other queries, alternatively, you can also message me and I will endeavour to come back to you as soon as possible. I have a number of beautiful antiques for sale, so please feel free to browse my other items. The item "LATE VICTORIAN MICROSCOPE OIL LAMP BY W WATSON & SONS HIGH HOLBORN LONDON" is in sale since Wednesday, May 9, 2018.